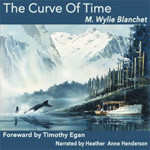 I’m so proud to announce the release of my latest audiobook, M. Wylie Blanchet’s memoir The Curve of Time. It is the first audio production of this beloved classic – and for me, it’s the fulfillment of a career-long dream. I searched for years for a producer who would share my commitment to it and could help me with rights and marketing. I hit the jackpot when I found the wonderful Carlyn Craig at Post Hypnotic Press. The Curve of Time is a collection of essays that Muriel “Capi” Blanchet wrote about the boat trips she took in the 1930s with her children along the coast of Vancouver Island and up British Columbia’s magnificent Inside Passage. Both her writing and the places she writes about are magical. I’ve been captivated by this book since the first time I read it many years ago. But just as extraordinary is the woman herself: eloquent, witty, tough, sensitive, sensible, and intrepid. Born in Montréal in 1892, Muriel Wylie Liffiton grew up in a well-to-do family; she attended private school and excelled as a scholar and a rower. She married early, at the age of 18, and shortly afterward she and her husband Geoffrey Blanchet moved to Vancouver Island, settling into a cottage at Curteis Point on the then-remote Saanich Peninsula north of Victoria. They bought a boat – the 25-foot cabin cruiser Caprice – and began to enjoy family outings in it around the shorelines and islands near their home. In 1926, Geoffrey took Caprice out on a solo camping trip and didn’t return. The boat was found empty, and his body was never recovered; his death remains a mystery. This left Capi a young widow with five children to raise on little more than her own wits and financial creativity. 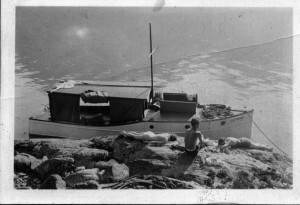 She began taking her children on summer-long sojourns on Caprice (I’ve wondered if she did this partly so that she could rent out her house as a source of income). She wrote essays about their trips and ultimately published them as a compilation, The Curve of Time, released just a few months before her death in 1961. 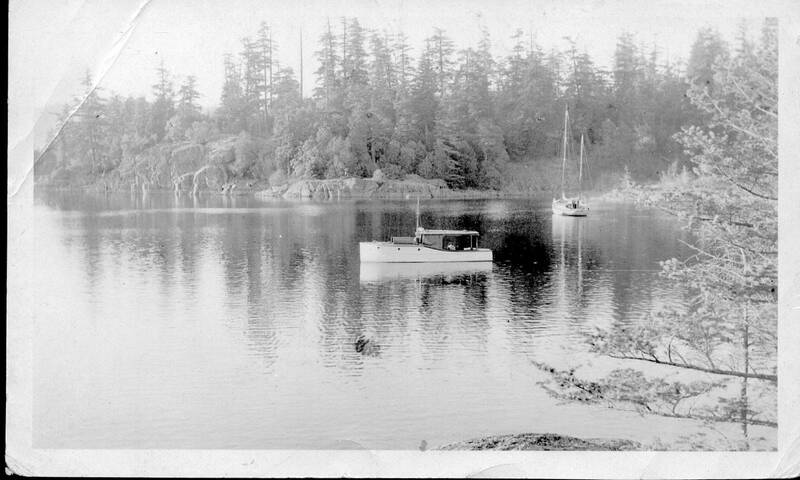 During their summer explorations, Blanchet piloted this little boat through every kind of water imaginable – open ocean, tidal currents, whirlpools — going as far north as Queen Charlotte Sound. They encountered bears, cougars, and orcas. 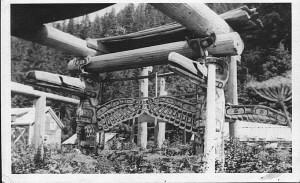 They explored numerous First Nations village sites, some of which had probably never been visited by whites. 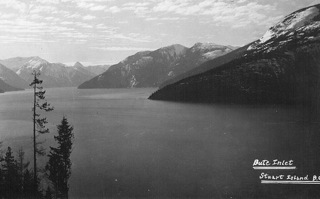 They climbed thousand-foot cliffs to gather huckleberries, and dropped their fishing lines into hundred-fathom fjords to see what they’d catch.
. . . I don’t think anyone could have summed up that book better than the logger from Michigan. Atlantic Monthly, Harper’s — he loved them. I would leave him a pile of them. At the end of the summer when we called in again, he would discuss all the articles with zest and intelligence. . . .
. . . We had hardly cleared Battle Point when the morning wind caught up with us, and with it some quite unexpected fog — soft and rolling. It would roll down the open channels in great round masses — hesitate for an island, and then roll over it and on. It would fill up all the bays — searching and exploring. It came on board and felt us all over with soft, damp fingers, and we hoisted our sails and fled before it. . . .
As an actor, I also loved reading her wonderfully skilled dialogue and dialects. With some audiobooks, I have to work pretty hard to make an accent sound natural or to distinguish my characters. Blanchet made it easy, writing even her childrens’ speech in a way that brought each of their personalities to life. 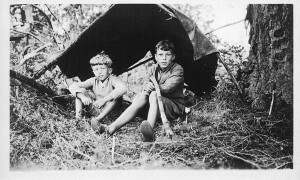 I especially enjoyed creating the voices of little John and his big brother (and rival) Peter! The narrative is always driven by her own energetic curiosity, imaginings, and vivid observations about the anthropology, boat navigation, marine life, and cultural history of this vast, untrammeled landscape. Each chapter / essay has a theme, but sometimes Blanchet tacks her way toward her destination “crabwise along the coast,” to use one of her own metaphors. And you don’t mind following her anywhere she goes. It was an honor and a joy to narrate The Curve of Time. I hope Capi Blanchet would have been pleased. The Curve of Time is available on the Post Hypnotic Press website. You can also find it on Audible.com. You can hear a sample on the book trailer in my YouTube channel. An excerpt from the first chapter is part of another audiobook I’d recommend: Summer Shorts, just released by Tantor Audio. It’s an audio collection of stories, poems and essays from a group of over 40 narrators, the proceeds from which go to ProLiteracy. 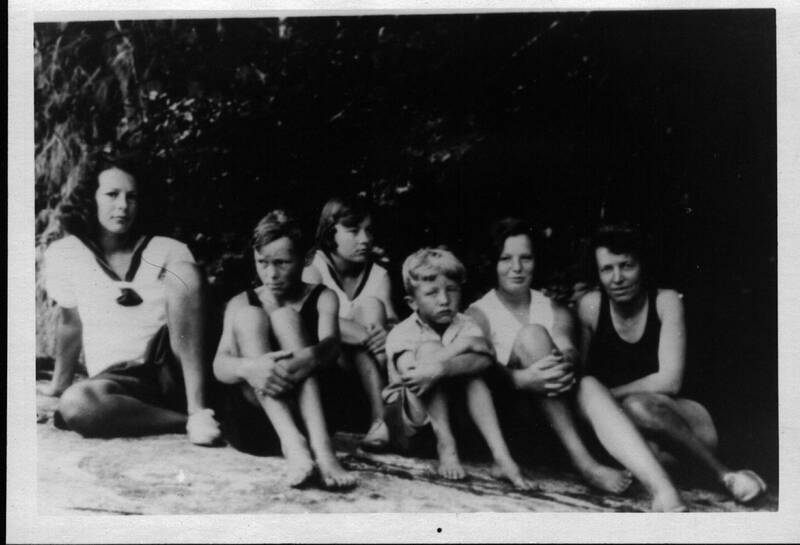 My thanks to the Estate of M. Wylie Blanchet for providing the family photographs above. Reprinted with permission.